After 12 years the Government of Canada has released a new Canadian Food Guide. I was excited about the new changes. The new guide shows an increased emphasis on plant proteins and less on meat proteins and dairy. Sugar, Tran fats, alcohol and juices are to be minimized and water is to be the drink of choice. The previous food guide (2007) was divided into four food groups – fruits and vegetables; grains; dairy; meat and alternatives. This past guide was sponsored by the large food industries including the Milk, beef, egg and poultry boards, who naturally had their own interests at heart. This time the government allowed no sponsorship from these groups and the new guide is based on health science. Hallelujah! 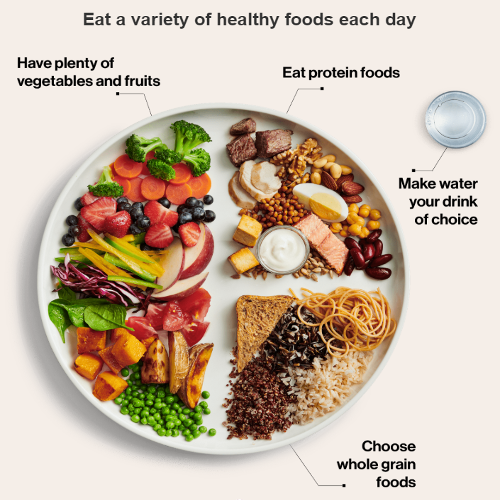 The plate image shows a significant change from the previous Food Guide illustrations. Your plate should now be divided as follows: ½ fruits and vegetables, ¼ plant-based proteins* or animal proteins, ¼ 100% whole grains. Juice and other beverages are no longer listed and the beverage of choice is water. Dairy is now on the back burner and no longer its own food group. It is now part of the protein category. Click the link to hear a clip from 680 News about the launch of the new Food Guide. * Soy, tofu, lentils, beans, nuts, nut and seed butters, whole grains -such as quinoa and brown rice.